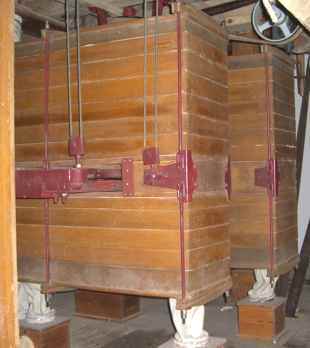 The set of break rolls and the "French" set of millstones produce a mixture of coarse meal, semolina, and fine flour. The sieving machine separates the mixture with the help of 12 sieves of different grades in one set for the break rolls and another set of 12 sieves for the "French millstones". The sieving machine moves the two sets of sieves against each other so that the grist is thoroughly shaken and moved from one level of sieves to the next. The first two top sieves are of corrugated iron, the following ten are of natural silk with ever smaller openings so that only the finest flour falls through. The remnants will be reverted to the milling machines for further milling, until there are too many "brown blots" from the bran which would darken the originally white flour too much. After approximately 12-14 passages the end of the milling process is reached (1 ton of wheat or rye is manufactured in 24 hours). Depending on the length and intensity of the milling process the return of fine flour lies between 60 and 72 percent of the amount of grain put into production. All the rest which does no longer contain flour is called bran which is collected separately and sold for feeding cattle and pigs.